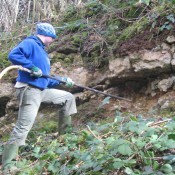 Using compressed air to clean away soil and moss. 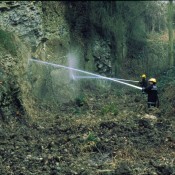 Target practice – help from the local fire brigade! 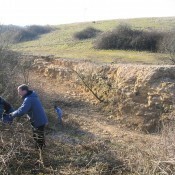 Scrub bashing at Foss Cross Quarry, Gloucestershire. 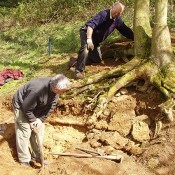 Rediscovering a lost contact in Jurassic sands and clays. 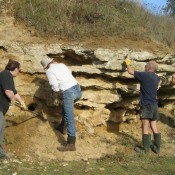 Spring clean with Oxfordshire Geology Trust. 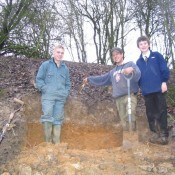 Finding an elusive small exposure at Sutton chicken pit, Suffolk. 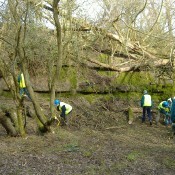 Help from local supermarket staff at Rock Edge Quarry, Oxfordshire. 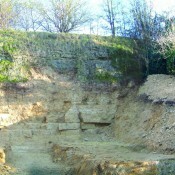 Site cleared using a JCB at Stoney Furlong, Gloucestershire. Cleaned by hand – using brushes. 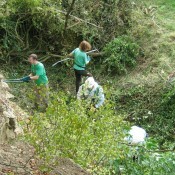 All hands on deck at Temple Grafton, Warwickshire.